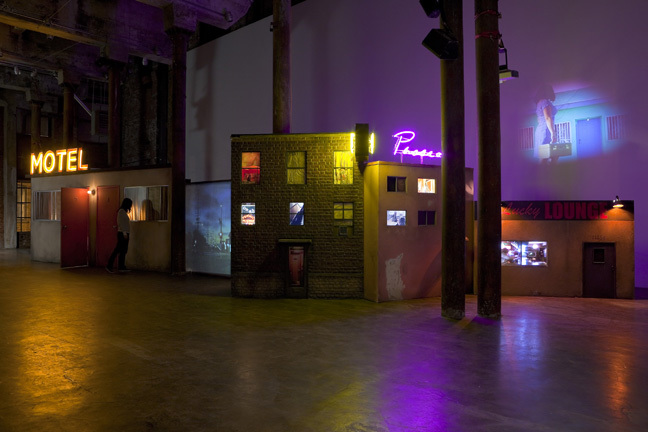 Smack Mellon is pleased to present Tracey Snelling’s installation Woman on the Run. 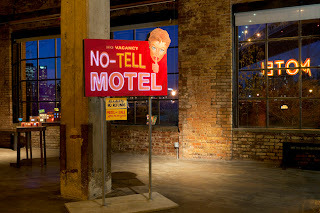 Snelling uses architectural elements and multimedia effects to create fictional character and scenarios full of intrigue. In the tradition of a film noir femme fatale, Snelling constructs a three-dimensional narrative around an ambiguous female persona wanted for questioning in relation to a crime. 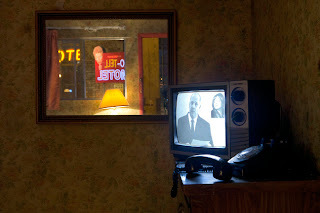 The visitor becomes a player in the story, searching for the enigmatic woman. Boundaries blur between victim and violator, fact and fiction, feminism and outdated views. “Woman on The Run is an installation that intricately mixes architecture, scale modeling, video, photography and 3-D story telling with a heady dose of Hollywood glamour and Hitchcock-like built-in suspense. A multimedia project, Woman on the Run explores a fragmented narrative about a fated woman. The main character, a combination of heroines and femme fatales from 1950’s and 1960’s film noir is trying to escape her fate. A crime has taken place, and she is wanted for questioning. Throughout the installation, different clues are given about what might have happened and who the woman is. Is she the victim, or the perpetrator? A study in feminism or an example of outdated ideas? 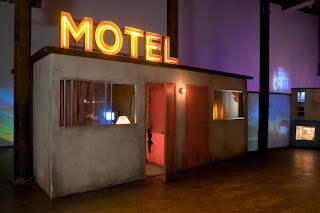 An alternate world of shrunken buildings, neon signs, and a life size motel offer a selection of clues that conspire to initially draw the viewer to the action and then help them thread together the disconnected story that just happened. The viewer quickly becomes a witness and to some extent an actor within the story, often assuming the role of a detective. Video plays in windows and conversations can be overheard. Reality becomes based more in perception than in absolutes. The blacks and whites of life shift to grey, and the truth becomes shrouded in mystery. Tracey Snelling is an internationally exhibiting artist living and working in Oakland, California. She graduated with a BFA in Art Studio from The University of New Mexico in 1996. 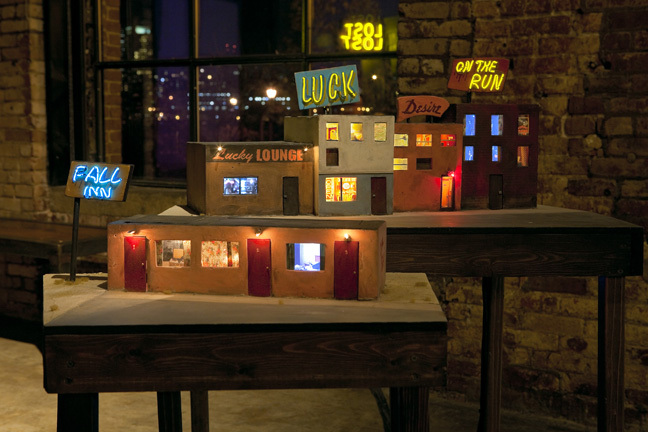 She explores reality and scale through sculpture, photography, and video. Her works are featured in numerous collections, including the Baltimore Museum, the Museum of Fine Arts, Houston, de Saisset Museum, and The West Collection, Pennsylvania. Her work has been exhibited internationally, including Gemeentemuseum Helmond in the Netherlands, Selfridges in London, solo exhibitions in Brussels, Amsterdam, London, and Miami, and at Art Basel. She recently returned from a 4 month art residency and solo exhibition in Beijing. This exhibition is made possible with public funds from the New York City Department of Cultural Affairs and the New York State Council on the Arts, a state agency, and with generous support from The Andy Warhol Foundation for the Visual Arts, The Greenwall Foundation, Jerome Foundation and Smack Mellon’s Members. Smack Mellon also receives generous support from the National Endowment for the Arts and the Recovery Act, Brooklyn Borough President Marty Markowitz, City Council Member David Yassky and the New York City Council, Bloomberg, Brooklyn Arts Council JPMorgan Chase Regrant Program, Foundation for Contemporary Arts, Goldman, Sachs & Co., Google, The Greenwich Collection Ltd., Helena Rubinstein Foundation, Milton and Sally Avery Arts Foundation Inc., The Robert Lehman Foundation, Tides Foundation, advised by Lambent Foundation, and William Talbott Hillman Foundation. 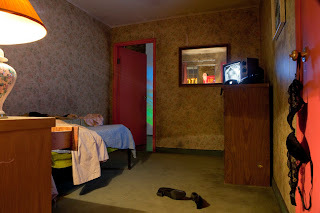 Woman on the Run was funded in part by San Pablo Arts District Fund, Galerie Urs Meile, EAmmune, Osborne Samuel Gallery, Aeroplastics Contemporary, Pan American Art Projects and Jane Wattenberg. Woman on the Run was originally commissioned by and shown at Selfridges in London during Frieze in October 2008, with the help of Nine AM and Wedel Fine Art. 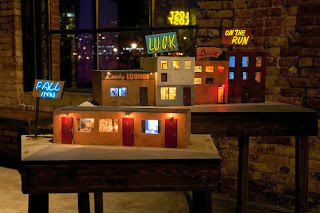 Woman on the Run intricately mixes architecture, scale modeling, video, photography and 3-D storytelling with a heady dose of Hollywood glamour and Hitchcock-like built-in suspense. 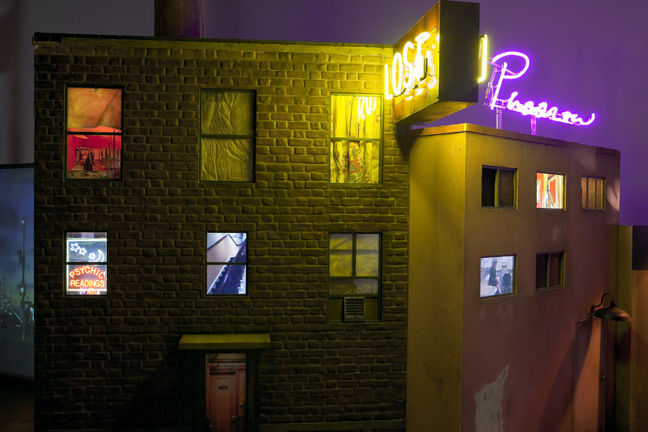 Through manipulation of scale and perception, this cutting-edge installation employs miniature recreations of urban decay and downtrodden malaise to highlight the plight of the independent woman in peril. Focusing on that film noir staple—the femme fatale—Woman on the Run straddles two realities, today’s and yesteryear’s. Initially commissioned by Selfridges, Woman on the Run was shown at the Oxford Street location in London during Frieze 2008, before being brought to the U.S., where it was shown in the non-profit art space Smack-Mellon in Brooklyn’s DUMBO district in 2009. After 21c, Woman on the Run will be showing in September 2011, through February 2012, at the Frist Center for the Visual Arts in Nashville, TN, and later at the Southeastern Center for Contemporary Art (SECCA) in Winston-Salem in March through May 2012.
content owned by Tracey Snelling except:. Simple theme. Powered by Blogger.